We were in St. Louis visiting friends and relatives. As always when I visit a place, I love checking out the thrift and antique shops and flea markets. This time I was on a mission to find vintage clothing or fabric to use for bear and doll clothing. St. Louis has two antique areas that I like to visit. One is the Central West End and the other is Cherokee Street. Cherokee Street is less high-end than the Central West End and it is easier to find bargains. There were several second-hand clothing stores there, but I didn't find anything for the dolls/bears. I did buy a pair of cute earrings for my daughter (a modern combination of new and retro). I also found some fun t-shirts and a small bag for my daughter at a Salvation Army store, and a vintage Japanese stuffed dog (for me) with a red beret at a thrift store near our hotel. In the last few months, I have gotten three new teddies for my teddy collection. Most of my small collection is artist bears. This teddy came from Japan and is by Rutsu. 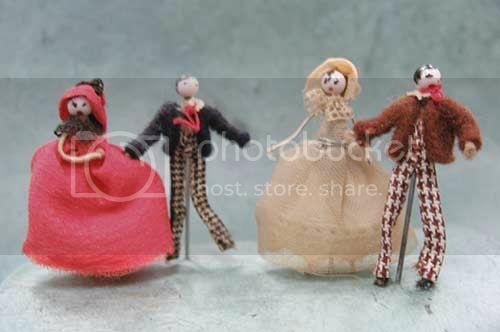 She has small, wonderful mohair teddies with a vintage look. This teddy came from Russia and is by Natalia Tolstykina. She has a blog here that you can translate automatically into English. The teddy is made of vintage rayon and is quite heavy. I love the unique face and all the handwork on this bear. The third teddy is by an internet teddy friend here in the U.S., Sharie Reetz. Her website is here, and you will also find links to her blog there. Her little mohair bears are brimming with character and are so endearing. The Sturbridge Vintage Fashion And Textile Show in Sturbridge, MA. takes place three times a year in May, July, and September. It is set to coordinate with Brimfield and is open for only one day - the Monday before Brimfield week starts on a Tuesday. This July I attended the show for the second time. This is an expensive show. There is a $10.00 general admission fee, and the clothing and textiles are generally quite high end and pricey. But, if you love textiles and vintage clothing, it is a wonderful show for inspiration and for purchasing smaller items without spending a lot of money. Here are some shots of booths from the show. I did buy some vintage lace trims, two small pieces of vintage fabric, and a little bag of vintage millinery flowers. For the Studio Shots - Tuesday this week, I am showing some of my bear collection that lives on a shelf of my computer desk. Here is my computer desk with the teddys on the top shelf. At the top of the shelf unit, I have five bears, an elephant, and a dog. The two animals on the right are a bear and a dog I made as samples for classes I taught. The others are artist bears and an artist elephant from my small bear collection. I bought them at bear shows before my now teenage daughter was born. This is a mohair elephant by Steve Van Houten. He has hand painted details and feels wonderful to hold. The second bear is "Artic Bear", a mohair bear by Clare and Matt Herz. I love his pointy snout. The smallest bear is hand-dyed llama by Grandma Lynn (Lynn Lumly). She has clay flowers on her chest, hat, and purse. She also has an embroidered rose on one foot. The white polar bear is Clara, a limited edition by Linda Spiegel-Lohre of Bearly There Company. She is wearing a ruffled felt collar. Irma is an "old-fashioned type humpback bear" by Louise of Bear Witness. 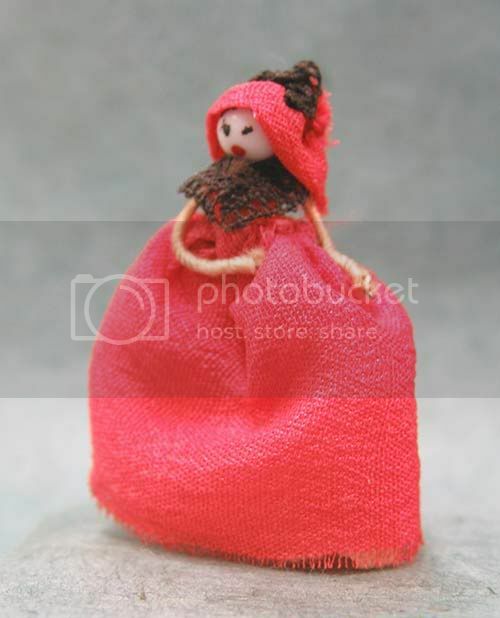 She is made from an old coat lining and has shoe button eyes. The last two critters are the ones I made as class samples. The crocheted bear was made as a sample for the Creative Crochet class I taught at our homeschool co-op. In the class, the girls learned how to do basic and fancy stitches, do shaping, and create three-dimensional shapes. Suzy has a blue dress that is incorporated into her body. 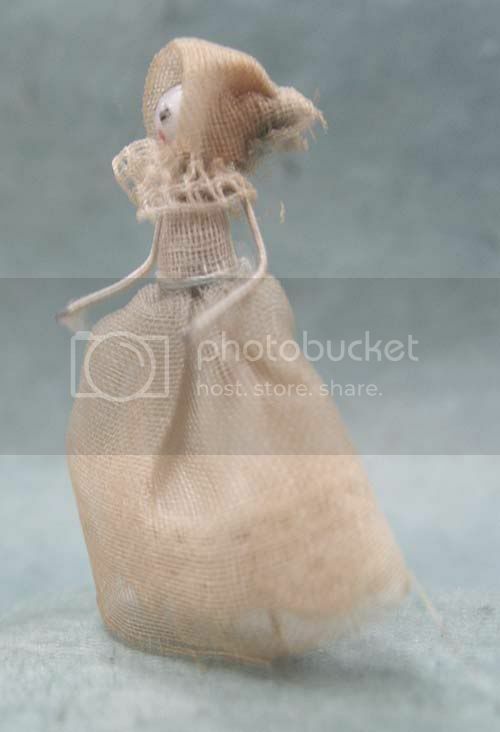 The top of the dress is part of her actual body, and the skirt and sleeves are crocheted to come away from the body. Riina is a sock-dog that was made as a sample for the Renegade Sewing class that I also taught at our homeschool co-op. She was based on a design from a Japanese Craft book about sewing animals from gloves and socks. You can read more about her here. When I was little, I desperately wanted a Barbie - the original bathing suit, pony-tailed Barbie from 1959. I liked the fact that she didn't look like the typical children's' dolls of the time with toddler-like bodies and faces; she had a mannequin's body, and her face had a sophisticated, almost haughty look. I wanted to be a fashion designer, and I thought she would be wonderful to design clothes for. Unfortunately, my mother wasn't willing to buy me a Barbie because she didn't think her adult appearance was appropriate for a children's doll. Then, as an adult, I started collecting artist dolls. I used to go to doll and teddy bear shows when they were more plentiful. There I found dealers who specialized in vintage Barbies and people who collected them. 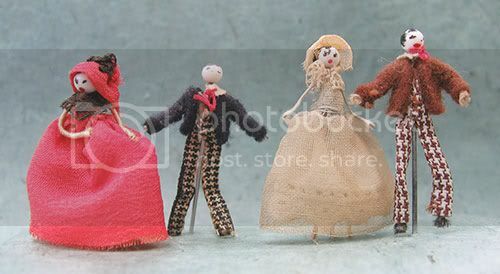 I did find some of the original 1959 Barbies but, now they cost about $3000.00 and I couldn't afford one. If I could have looked into the future and seen that I would still want a Barbie when I grew up - I would have really pestered my mom until she gave into me. I gave up on getting one of the original Barbies, but have recently been ogling the 50 year anniversary Barbies that are reproductions of the first bathing suit Barbies. Maybe I'll finally get my Barbie, after all. from Violet Pie - Look What Came in the Mail! I ordered two little critters from the talented Violet Pie and was so excited to find them in the mail box a few days ago. The first one is a small, white mohair rabbit with needlefelted legs and tail. The second one is a blue needle-felted elephant with orange ears. His head and legs are jointed. They are both amazing -- sweet, whimsical, and beautifully crafted. I am so happy with them. Violet Pie is as nice as she is talented. Please check out more of Violet Pie's wonderful work in her Etsy shop , Violet Pie - A Little Shop of Things, and on her blog, Violet Pie. Charms are Charming - "A Charmed Life"
"Let fall thy blade on vulnerable crests, I bear a charmed life, which must not yield To one of woman born." Macbeth (5:8): Recently trying to find the origin of the phrase "a charmed life", I was surprised to find that the phrase "a charmed life" actually originated with Shakespeare. Doing a little more research, I found that charms (or objects used to protect, give luck, and show status) date all the way back to the stone age, with records of the first actual charm jewelry appearing in ancient Egypt. I love charms - mostly the vintage ones that look like pop art to me, depictions of every day objects, sometimes enhanced with bright enameled colors or that have interactive themes such as mechanical movement or a view of a special scene through a tiny telescope charm. For one of my adult birthdays, my mom gave me a beautiful gold chain bracelet and said she was starting a charm bracelet for me. She was an avid flea market shopper and had a knack for finding the best bargains, which she many times turned around and sold for a profit. After that birthday, I received vintage charms for several birthdays, which I added to my bracelet. I still have two charms that need to be added onto the bracelet. I don't wear my charm bracelet too often, but take it out occasionally to enjoy the special charms and to reminisce. I would like to have it eventually added to another chain and made into a necklace. I also started collecting vintage sterling charms. I found a couple of vintage sterling chains and decided to make some charm necklaces. The finished necklaces are special to me, and I always get compliments on them when I wear them. Please stay tuned for an easy tutorial on making your own charm necklaces in a future post. We went to the Brimfield Antiques Market on Sunday. Brimfield is a huge week-long outdoor flea market held three times a year (May, July, and September) in the town of Brimfield, Massachusetts. It's a very old show dating back to 1959. Dealers and visitors come to Brimfield from around the country. The show started on Tuesday, so when we arrived late Sunday morning, many dealers were already packing up to leave. There was still plenty to look at though. I was on the lookout for a sterling necklace chain (which I found), vintage buttons, charms, and fabrics. I found a 1950's Little Lulu comic book and brought it home with me, too. My daughter was looking for a sword pendant necklace for her friend, but didn't find one. We did find a giant pendant, about six inches long with a dangerous-looking real knife in a shield. She didn't come home with that one. We're going again in July. Next time we'll go in the middle of the week. Here are some photos of booths that caught my eye. I love transferware, but after seeing some of the beautiful transferware mosaic furniture in Kaffe Fassett's mosaic book, Mosaics: Inspiration and Original Projects for Interiors and Exteriors, I always associate the lovely china with broken mosaic pieces. Metal helmets, snowshoes, butter churns, etc. Vintage wooden bracelets and metal cosmetic cases. Rabbits and roosters on bamboo-style chairs. Rusty cabinet (dentist's cabinet?) and blue canoe. Rattan and other mid-century furniture. And one of the fun sights. One vintage high wheel bicycle, one new. After Benny our standard poodle came to live with us, I started noticing a lot of poodle collectibles at flea markets. I had never been very interested in them before, but now I found their kitchiness endearing. Before long I was starting my own poodle collection. I found most of the poodles at flea markets and by pouring over the "poodle collectibles" pages on eBay. I found ceramic spagetti poodles, a vaseline glass jar with a poodle standing on the lid, a wooden poodle with jointed head and legs, two small stuffed vintage poodles, a poodle in a convertible car salt and pepper shakers, and a small statue of a Barbie walking a poodle. One of my favorite finds was a faux wooden tray by Kentley with scene 1 from the five tray series, "The Romance of Fi Fi and Pepe". Each tray depicts a different scene from their romantic adventures. I added some poodle graphics to my collection including a sheet music cover with a poodle tugging on a clown's pants, and a poodle paper doll page from a 1923 Ladie's Home Journal magazine. Another addition was a vintage hemmed fabric piece with blue flocked poodles. A collector friend became interested in my poodle collecting and started alerting me to the poodle finds that she discovered. Now that I had this nice but small poodle collection, I wanted a place to display it. Another collector friend took me to a shop that along with painted country furniture and foods, carried a huge selection of display cabinets ranging from large furniture to smallish wall pieces. I fell in love with a cherry wall cabinet and it came home with me. Here is the cabinet which holds a large part of the poodle collection. (and my reflection in the glass - oh, well) The poodle graphic designs were framed and flank both sides of the poodle wall cabinet. The tray is too big to fit in the cabinet, so it's displayed in a nearby wall unit. Poodle Collectibles of the 50's and 60'sby Elaine Butler is a fun book with lots of great photos of poodle collectibles. It's out of print now, but may be available used or through libraries. I am having a blast with GuruLib. It is quite flexible. You can add your own custom category shelves. I have added mystery, reference, literature, French, teddy bear, and doll book shelves to my GuruLib library. There is cross-referencing so that you can put a French movie under videos and also in a French shelf. It will show up in both places. You can organize your items by title, author (or director, developer, etc. depending on the medium), rating, publish date, and more. There are also several options for viewing the items on a shelf or in your entire library including two sizes of cover photos, a simple listing with a small graphic to indicate if the item is a book, movie, software, music, or game. A fourth option, the details view, gives all item information including author, publisher, publish date, your rating if any, and the genre of the item. A new feature of the detail view is "cover flow". In the cover flow option of the details view, the details list moves half way down the page and the top of the page shows large cover photos of the books in that shelf with the center image the largest. If you scroll your mouse wheel away from you, the covers move right and back as if on a lazy susan. If you scroll the mouse wheel towards you the covers move left and back. It's a nice feature. If you have a collection of rare or out-of-print books (or games or movies), they can be added manually. You can add your own photos of the covers by scanning, uploading pictures you have taken, or capturing them with a webcam that connects to GuruLib. There is also a borrow and lend feature where you can keep track of items lent or borrowed, to whom, and due dates. overdue items are marked "overdue". The support was very quick, friendly, and efficient. I was even sent screen shots with text explaining how to perform various functions. Mohammad Rana Basheer has a blog that can be accessed from the GuruLib site. He uses it to talk about updates and new features explaining how to use them. I am quite happy with GuruLib. The only issue I have noticed is not being able to set the default image view to Large Thumbnail. As the cover photos in Large Thumbnail are bigger, clearer, and less distorted, I like to change to that view for every visit. But I feel this detail is just a small inconvenience. 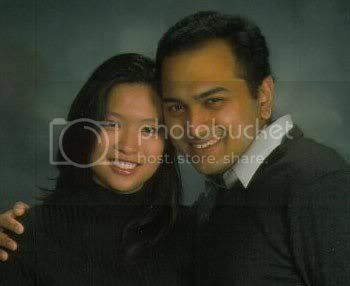 GuruLib was started by two University of Missouri, Rolla graduate students, Christina Leung and Mohammed Rana Basheer. When and why did you and Christina Leung start GuruLib? Were there other online options at the time that you could have used instead? GuruLib was the brain child of Christina. Before GuruLib, she used to maintain our collection of books, movies, games etc. on an excel sheet. The problem with that was every time we buy a new movie or a book, she had to search several online resources to collect the cataloging information. Additionally, if we wanted to find a movie or book there was no way to search through the list. The excel sheet was also not suitable for keeping track of books that we loaned/borrowed from friends. Since we were both students, borrowing from friends and public libraries was the main source for feeding our avid interest in books and movies. Very quickly keeping track of our collection and borrowed list became an overwhelming task. So we decided to search for an online free tool to help us organize our collection. The closest we could find was "Delicious Monster" which was a Mac application. We found some online tools for only books (http://www.librarything.com) but our home library had books, movies, music, games and software. Moreover, None of the solutions had a way to check for a book/movies in your local library. We had to individually register with our local libraries and search through their web pages separately. We were totally surprised that nobody thought of providing a one stop solution for organizing a home library. So Christina suggested that we build a tool to do exactly what we want and hence GuruLib started. Why did you add some of your unique features? Every feature in GuruLib is the result of trying to solve our home library cataloging and tracking needs. Very early on we were blessed with a core group of GuruLib users who provide us with feedbacks, new feature suggestions and bug reports. This has helped GuruLib feature list to grow organically over the years while solving day-to-day organizational problems in a home library. We run this website as a hobby and and we resisted several early offers to go big. We believe that once our livelihood is depended on GuruLib then we will be forced to push more advertisements and hence reduce the overall experience of this website. Nevertheless we do receive commissions on books, movies, music or games purchased through GuruLib and also from Google Ads. These revenue help us offset some of the cost associated with internet hosting and bandwidth. What does GuruLib do to update and improve the site and how do you decide which features should be changed or added? We try to put in approximately 30 hour/week on GuruLib related work. I mostly handle fixing bugs and adding new feature code while Christina works on graphic design, testing and conceptual designs. From August of 2007, a fellow MST student Jordan Varble has been helping us with web design. When we get a feature request, our first question is do we need that for our home library? If the answer is yes then we go ahead and implement that feature. Else we will contact the person who suggested the feature to provide us some more information about the usability of this new feature. We have implemented close to 96% of requested features. Sometime we had to turn down some requested features because of the lack of man power. For e.g. We had several requests to make GuruLib multi-lingual but the effort to maintain multiple languages and the time to make our existing code multilingual has prevented us from venturing into that. Another example is to provide "GuruLib groups" and a forum for listing old books/movies etc. for sale. Edit: correction. I heard from Rana that you can set the view to the default you want. Here is what he said. "One thing I could like to clarify is that if you would like to change your default view to "Large Thumbnail", you may do that from your "Settings" page. Attached screenshot might give you an idea about the location of the default view selection menu in the settings page. You need to be logged into GuruLib to access the settings page. 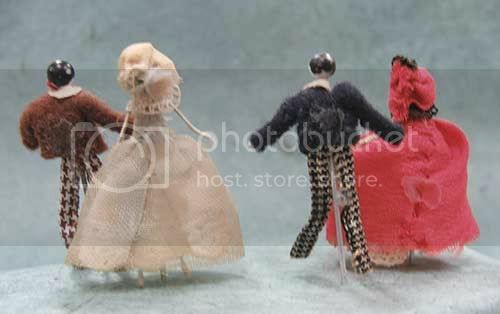 Thanks and Regards Rana Basheer"
I got these dolls from a button seller at a flea market. 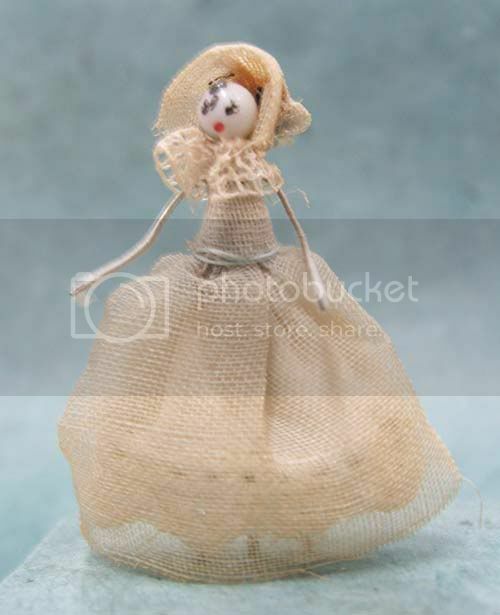 I haven't been able to find any information on this type of doll in either doll collecting books or internet searches. 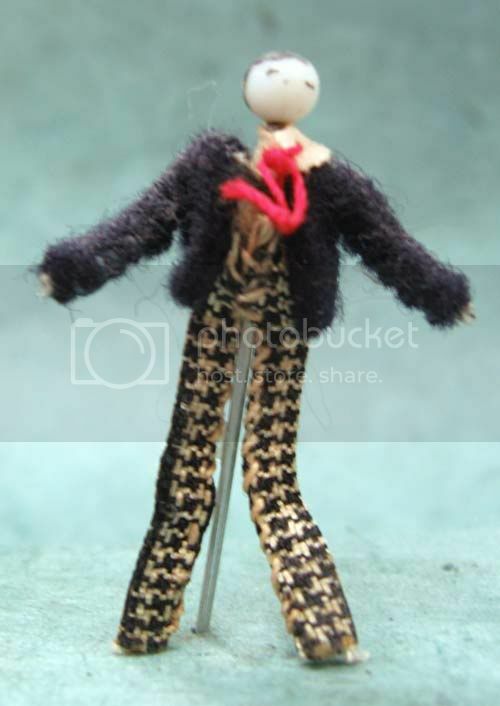 The heads are the heads of the pins, arms and legs are thin coated wire, and the tiny clothing seams are hand sewn using fabrics that appear to be cottons, including voiles, and wools or felt. There is a little circle of glue on the back of each one. They stand by pushing the end of the pins into a softish base. 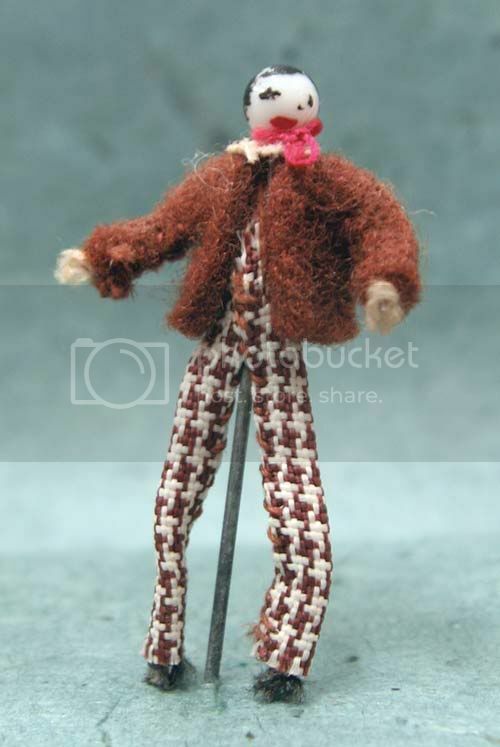 The dolls are quite detailed for such tiny objects. If anyone has any information on these, I would love to know more about them. As a kid, I collected comic books. We had a big painted cabinet in the over-sized hallway of our St. Louis duplex with two shelves stuffed with over 200 comic books. When friends came over we hung out on the hallway floor and spent the day reading and playing board games (our other obsessive pastime). My comic book addict friends also had large comic book collections. When I visited their homes our usual activity was reading and discussing comics. When our daughter was learning to read, I started searching out sources for comic books. My only favorites that were still being published were the Archie and Betty and Veronica series. I could also find the Disney Donald Duck comics. Their forms had changed to fat, little mini books. I got some of these, and my daughter loved them. 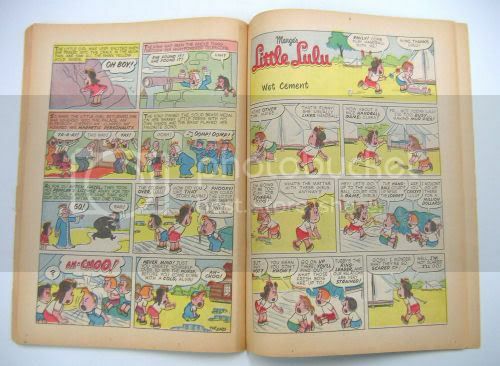 But, I wanted to share with her the comics I loved most as a child, Little Lulu. A search at local book and comic stores turned up an expensive hard-cover book. I wanted the originals though. 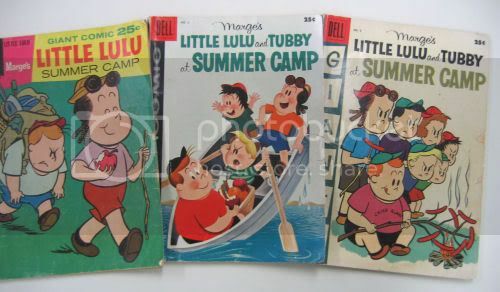 This lead me to a search on eBay where I was able to find some of my favorites -- the Giants, big, thick 25¢ specials like Little Lulu Goes to Camp and Little Lulu Halloween. The 25¢ specials now ran $30.00 and more a piece. I also found some original Betty and Veronica and Little Richie Rich which were much more affordable. 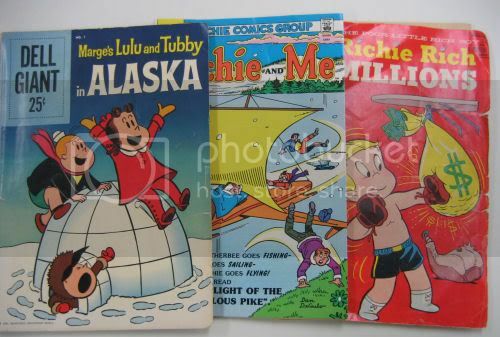 I bought some of each, and Little Lulu also became one of my daughter's favorites. Michele Maki has a wonderful Little Lulu history and information section on her homepage website here. The Little Lulu stories have been reprinted in a series of books still available, Little Lulu series. The nice thing about comic books for kids is the format; the pictures drive the story and can be followed even if the reading level is very low. The humor and drawings are so engaging that kids will pore over them, trying to get as much of the reading as they can because they want to. I never worried about comic books not being suitable reading material for my young daughter. My main concerns were for her to enjoy reading and to read a lot. I collect buttons. To me, they are exquisite pieces of miniature art. Some of the vintage button cards also have wonderful graphics. As a design student in New York, one of my favorite haunts was was a tiny retail store on the upper east side of Manhattan, Tender Buttons. There, unlike the wholesale button stores in the fashion district, the buttons at Tender Buttons were sold individually and were expensive even back then. To me, going to Tender Buttons was like visiting a museum. The owners loved to talk about their buttons and it was always a learning experience. I saved my money to buy a few buttons when I could, and my button collection slowly grew. The store is still in the same spot at 143 E. 62nd St. at Lexington Ave.
Later, I joined a local button club and the state and national button societies. At the meetings, a member would talk about a specific type of button such as 19th century lithograph portrait buttons and bring some examples to show. Then we would check out buttons people had brought to sell. The state button club meetings had a room full of button and button frame vendors. They were wonderful for finding unusual buttons. A button face card made with buttons from my collection. Some of the buttons include two celluloid Art Deco flapper buttons 1920's - 1930's (top and bottom of card), a bone cat button, bone flapper button, bone face button 1920's (second and fifth rows), a sterling Victorian Kate Greenaway button with girls dancing, red horn portrait button (third row), tintype - mid to late 1800's (fourth row), Victorian portrait lithograph buttons (fourth and fifth rows), child photo portrait button 1930's (fifth row), painted wood dog heads button and mother of pearl dog head button(seventh row), and two Japanese Satsuma buttons (eighth row). My button collection had always been stored in small drawers and was brought out for browsing or showing to friends. From other members in the club, I learned about displaying buttons on button cards and about the special button card frames that are used to display them. Now I have some of my favorite buttons in frames on the wall going up the front hallway stairs.